We have a fun new alphabet printable to share with you! Have a child working on learning to write the letters of the alphabet? 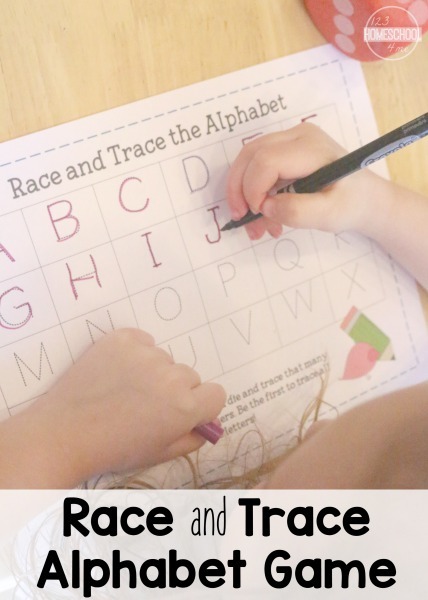 Play this fun Race and Trace Alphabet game! It's perfect for your preschool or kindergarten-aged kiddo! Use this printable to play with two people, and make it a race or simply roll and trace the letters by yourself. Either way it is a great way to practice writing the letters of the alphabet. The game is simple, roll the die and trace the letters! Love simple, no-prep alphabet games! Head on over to 123Homeschool4Me to find out different ways to play and download the printable! Looking for more alphabet activities? Check these out!